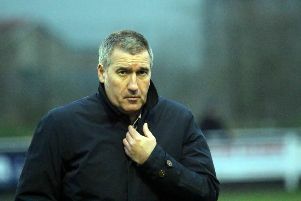 Banbury United boss Mike Ford believes there is a new resolve about his squad. The Puritans have come through arguably their worst run under Ford to go three games unbeaten in Evo-Stik League South. In those three premier division central games, Ford has seen his side twice come from behind to make their point and produce their best display of the season to take all three against AFC Rushden & Diamonds. Ford said: “There is more confidence in the squad now, the players know we’re all together in this. We’ve gone down the old route of training hard and then playing like that in games. “Players are winning their individual battles on the training ground and on the pitch. They need to know that we have to be competitive in training and match days to keep getting results in this division.